After 2013’s CURSE OF THE SCARAB, which introduced Honey, a Great Dane with a big heart and a bit of a slobber problem, Lilah and I were eager to read the second in the series. 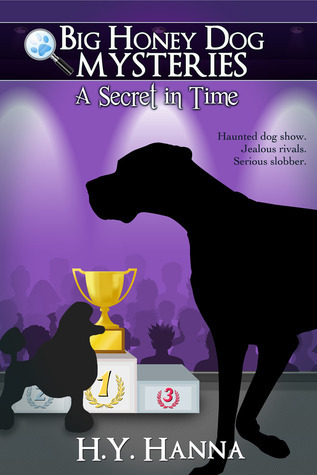 This adventure/mystery is set at a dog show, returning for the first time in ten years to the showgrounds supposedly haunted by the dogs who perished in a fire the last time the dog show was held there. As Honey is called into service to impersonate a show dog, one Best in Show contender after another falls victim to strange accidents. Can Honey and friends get to the bottom of mysteries both past and present? I’m with Lilah. Let’s read a million more Big Honey Dog mysteries. We’ve read the first two full-length novels twice, as well as the three holiday-themed novellas, and we never get tired of them. A first-“person” novel from the point of view of a dog could be ridiculous or tedious, but in Hanna’s hands, it’s delightful. Honey is self-conscious about her drool problem, curious, and eager to help others. Some of her friends from the first novel return to this one, and we also meet a few new ones. As in the first book, not judging others by their appearance, heritage, or first impressions is illustrated without being heavy-handed, and there’s a lovely lesson of forgiveness in SECRET IN TIME that made both of us tear up. At the same time, references to the dogs leaving “pee mail” for each other or exclaiming, “Holy liver treat!” and the like made us chuckle. The mystery is engaging and suspenseful, with a satisfying resolution. This is a fun ghost story/mystery from the point-of-view of a well-developed character who happens to be a dog. Highly recommend, and we look forward to reading #3. Our review of BIG HONEY DOG MYSTERIES #1, CURSE OF THE SCARAB, is right here. Source disclosure: I received an e-galley of this title courtesy of the author. BELLMAN & BLACK, the long-awaited followup to Setterfield’s stellar debut, THE THIRTEENTH TALE (2006), is subtitled “A Ghost Story,” and it is. Not strictly in the traditional sense, but the story and its characters are haunted. As in THE THIRTEENTH TALE, Setterfield uses her gift for creating atmosphere to cast a gloomy sense of dread over even the happiest moments of Bellman’s life. As a child, William Bellman kills a rook with his slingshot, a chance act that he quickly forgets–but that never forgets him. A mysterious man turns up at funerals, at first on the periphery, eventually introducing himself as Black and striking a strange bargain with Bellman. Bellman, afraid to ask the exact terms of the deal, proceeds blindly, changing the course of his life and making his fortune with it. But what is the deal? And when will Black collect? In the midst of the rise and fall of Bellman’s fortunes (and the litany of tragedies that befall him) are interludes about the rook that are both informative and poetic. The lore and the nature of the rook infuse the narrative, the dark, inevitable presence haunting Bellman until the final reckoning. Source disclosure: I received an advance copy of this title from the publisher.